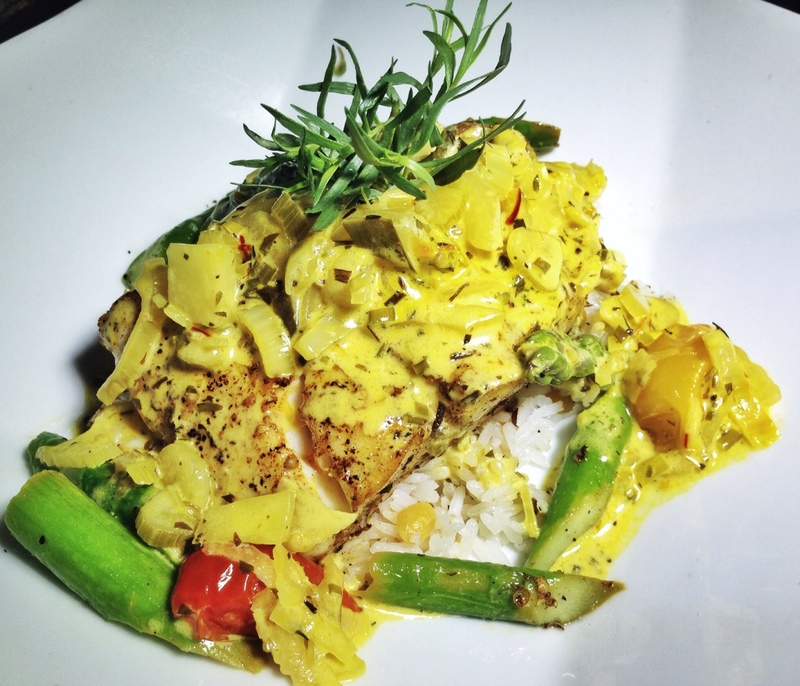 Right in the heart of downtown Laguna Beach is a charming family restaurant called Nirvana Grille. I have driven past the restaurant a hundred times, and it wasn’t until recently that I stopped in to try their delicious cuisine. From the moment that I walked into the restaurant, I felt like I was at home. The staff gave a friendly greeting, and showed me the way to their large outdoor rooftop patio for an alfresco dining experience. The large outdoor patio has a beautiful panoramic view with cool ocean breezes. I started the dining experience with sipping on my favorite cocktail, a Blackberry Bliss Mojito. The mojito was pure bliss, and the perfect prelude to our epicurean adventure. 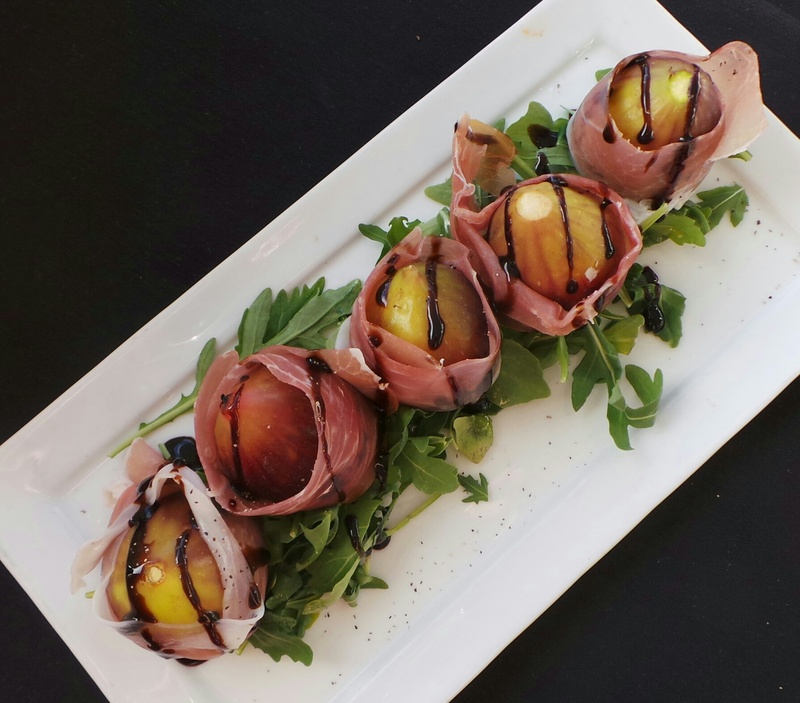 We started with roasted figs from the home garden of Chef Lindsay Smith-Rosales. I was immediately impressed with the beautiful presentation, and my tastebuds exploded after tasting the honey and pepper goat cheese inside of the Turkish figs. 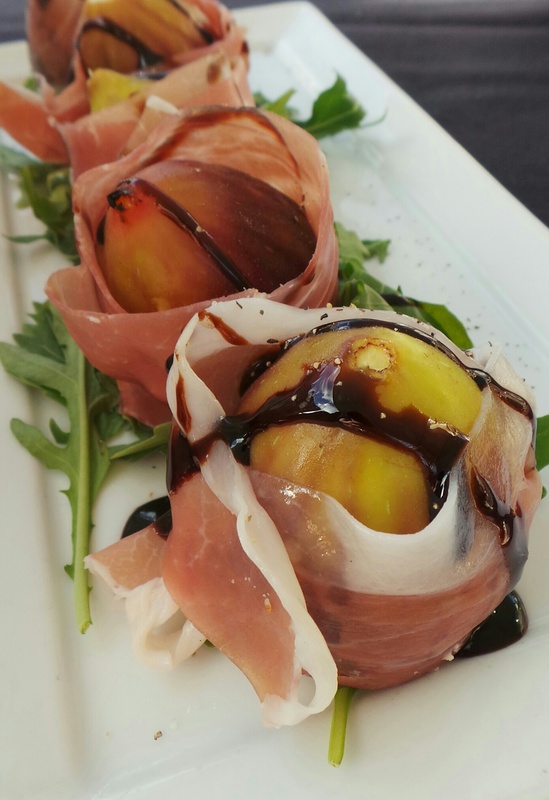 The figs were presented wrapped with prosciutto, drizzled with balsamic reduction, and sitting upon a bed of wild arugula. 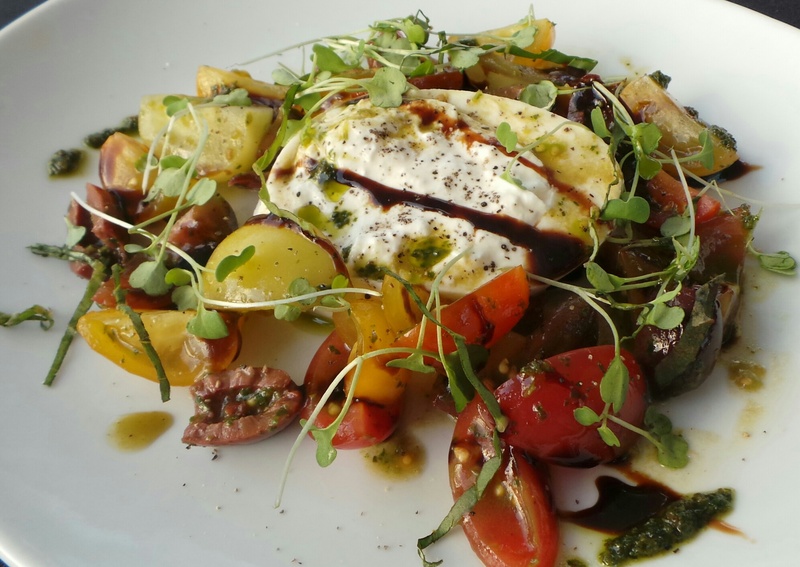 There is not a cheese in the world that I love more than burrata, and when the Burrata and organic heirloom tomato salad arrived, I was in heaven. Surrounding a large piece of firm burrata with a creamy center was heirloom tomatoes, basil pesto, balsamic reduction, kalamata olives and micro arugula. It was perfectly paired with a glass of Qupe “Y” Block Santa Barbara 2012 Chardonnay. This is not a salad that you will want to share because you’ll want to indulge in every last bite. 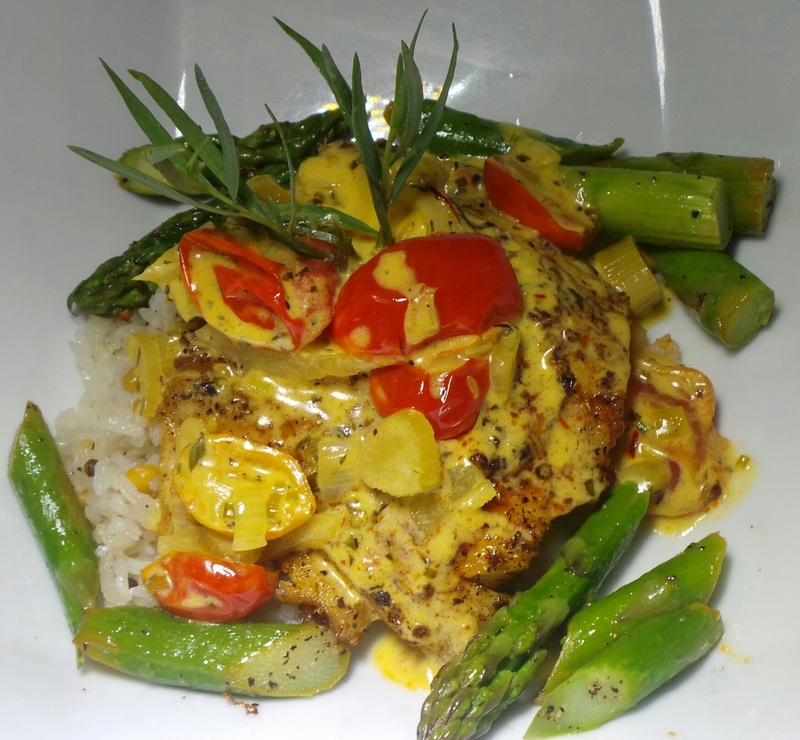 The other guests that I dined with for the evening had the Coriander Spiced Black Cod with saffron cream sauce, fennel, asparagus, tomato, and fine herbs. Their dish was paired with a La Crema Sonoma Coast 2011 Chardonnay. 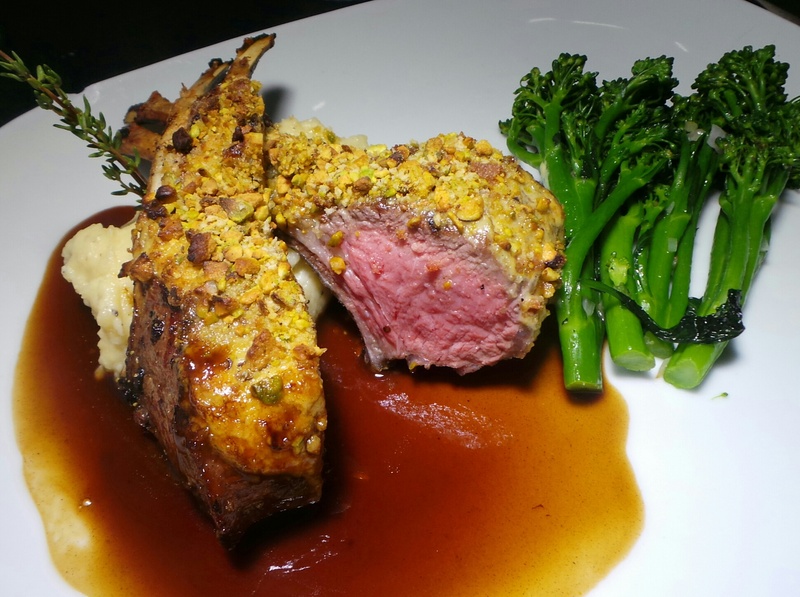 For my main course, I selected the Australian Rack of Lamb with a Pistachio Dijon Crust. The lamb was cooked to perfection with a rosemary demi-glaze, broccolini with shallot butter, and goat cheese mashed yukon gold potatoes. 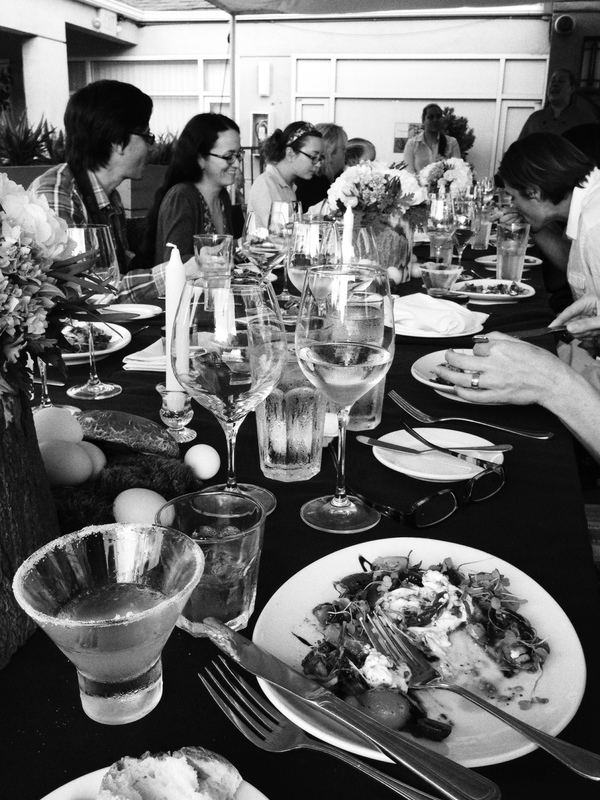 The dish was paired with a Lyric, “by Etude” Santa Barbara County 2011 Pinot Noir. While I have never been a fan of a Pinot Noir, this wine complimented the lamb perfectly bringing out the rich flavors of the rosemary demi-glaze. 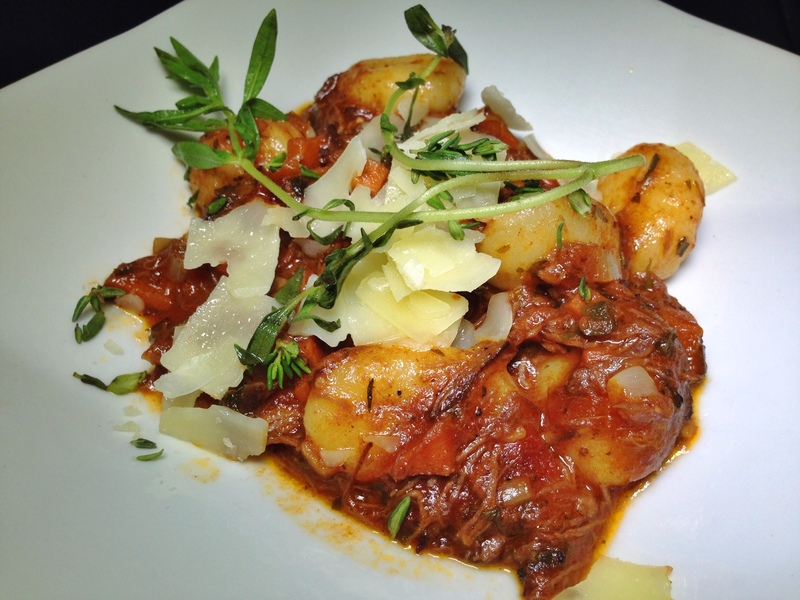 Just when I thought the evening could not get any better, we were brought an Intermediate Course of Braised Meyer Short Rib Gnocchi. 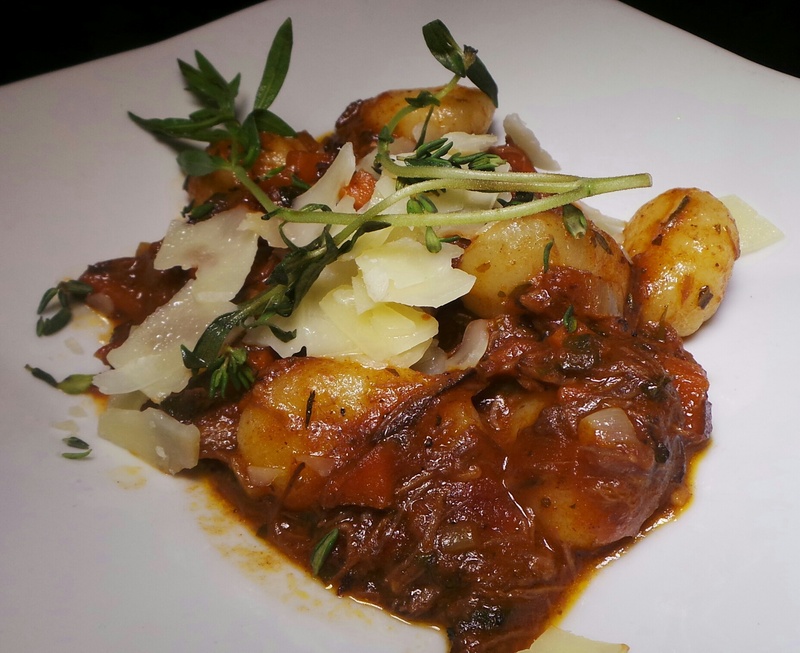 The potato gnocchi married with Meyer short ribs, tomatoes, carrots and herb ragout. The dish was paired with Force of Nature, Paso Robles 2011 Cabernet Sauvignon. 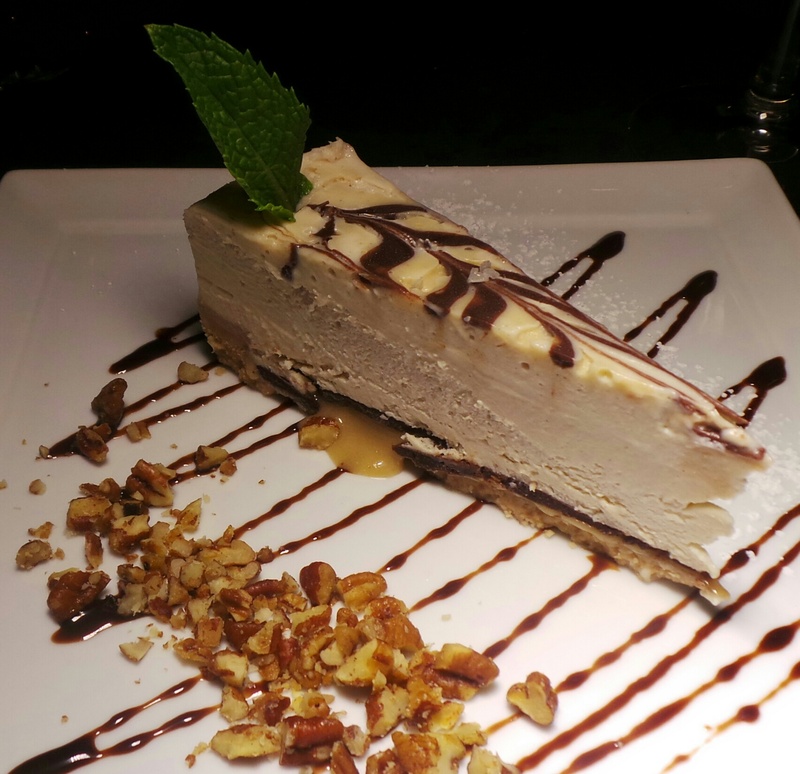 I ended the evening with a piece of their Organic Cashew Almond Salted Caramel Pie. The vegan dessert is made with organic agave pink salted caramel, raw cocoa chocolate, organic coconut, cashew and almond milk custard, lecuma, almond and macadamia crust. While I savored my pie, the other guests indulged in their Ice Cream and Gelato Trio. 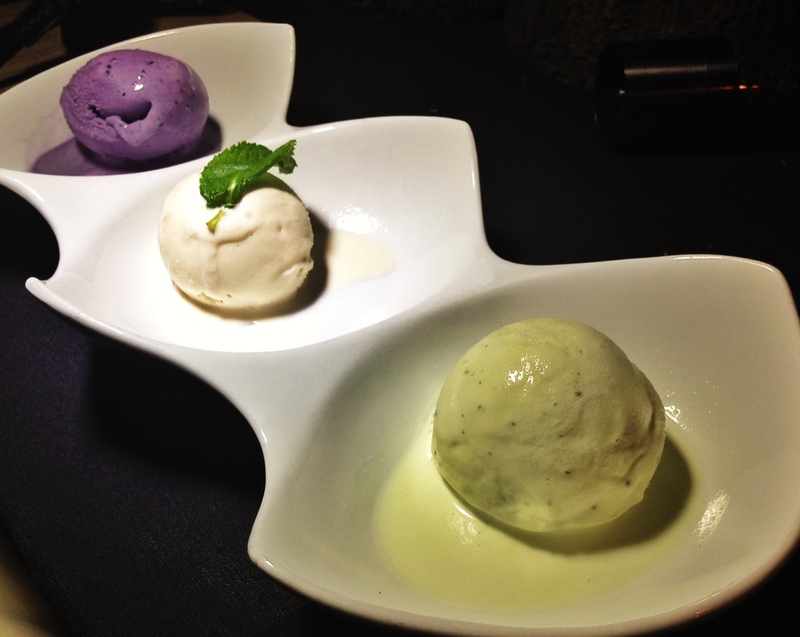 The trio came with a housemade goat cheese maple ice cream, blueberry lavender, and basil cream gelato. At Nirvana Grille, your family can dine knowing that your children are getting the highest quality of food available. All of their seafood is 100% sustainable, meats are antibiotic and hormone-free, poultry is free-range and organic, ground beef is grass fed, and produce is locally sourced. Your family is invited to try the all-new Nirvana Grille summer menu at 50% off from June 24th through the 29th. They are open Tuesday through Sunday from 5pm to 9pm, and are located at 303 Broadway, Suite 101 in Laguna Beach at the corner of Beach and Broadway.